Area S-15 is the fifteenth course of Rainbow Summit and the eighty-eighth course overall in Mario vs. Donkey Kong: Mini-Land Mayhem!. 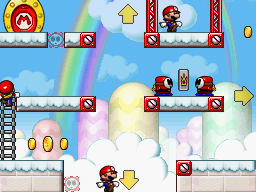 Two Mini Marios begin along the top while the other begins near the bottom center, with the exit door on the top left. In order to reach it, they must simply be guided via a series of Shy Guy Blocks and Red Girders to it while avoiding Shy Guys. The M-Token is located at the middle right, just below a Shy Guy Block. To collect it, a Mini Mario must drop from the Shy Guy Block once a Shy Guy is trapped inside of it. The Mini Mario Card is located at the very center, guarded by two Shy Guys. A Mini Mario must simply head to it after the guarding Shy Guys are drawn away via Red Girders. In Plus Mode, the two Mini Toads must be guided to the exit door first, followed by the Mini Donkey Kong. In order to earn a trophy, the player must score 11400 points.